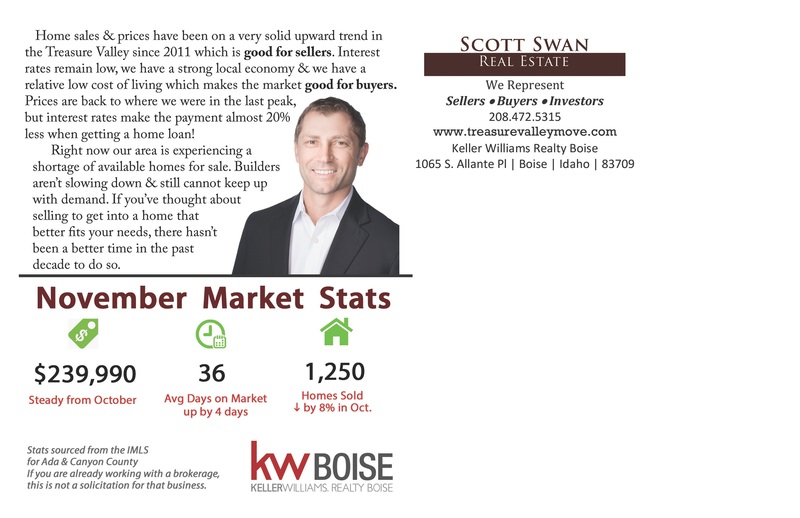 Home sales & prices have been on a very solid upward trend in the Treasure Valley since 2011 which is good for sellers. Interest rates remain low, we have a strong local economy & we have a relative low cost of living which makes the market good for buyers. While prices are back to where we were in the last peak, interest rates make the payment almost 20% less when getting a home loan. Right now our area is experiencing a shortage of available homes for sale. Builders aren’t slowing down coming into fall and still cannot keep up with demand. If you’ve thought about selling to get into a home that better fits your needs, there hasn’t been a better time in the past decade to do so. We’ve helped dozens of families right size their homes this past year and I’d love to talk with you about your goals!